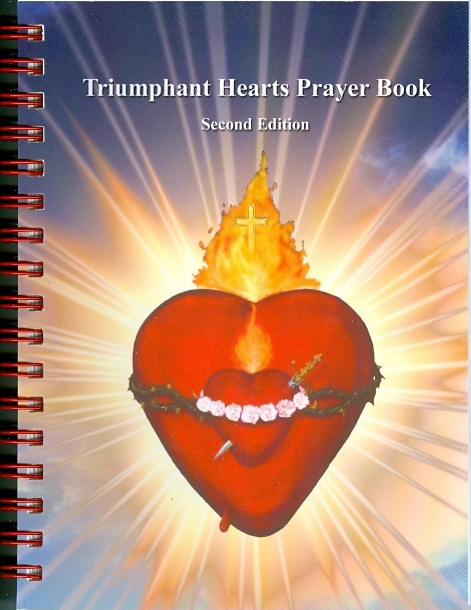 Booklet: "Triumphant Hearts Prayer Book", 2nd edition. Book: Triumphant Hearts Prayer Book (Second Edition). *The Chaplet of the United Hearts,*Four Sets of Rosary Meditations,*Meditations on the Stations of the Cross,*Meditations on the Seven Sorrows of Mary,*Consecration Prayers,*Daily Offering Prayers,*Prayers before Mass and after Communion,*Prayers to Live in the Present Moment,*Examination of Conscience Checklist,*Self love vs. Holy Love Reflections,*Five Day Novena to Our Lady of Guadalupe,*Novena to St. John Vianney for Priests,*Information about forming Prayer Chambers,*Missionary Servants of Holy Love Handbook,*Information on the Confraternity of the United Hearts,*Transferable Blessings. Spiral bound. 4-color print cover. Inside pages are two-color print. Front cover measures 4.5 x 6 in. 184 pages.